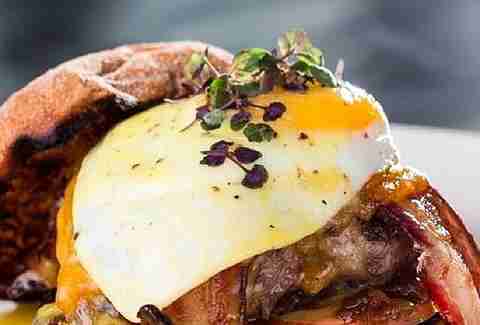 Some are gourmet, some are no-frills, and some are already half-eaten 'cause we got super hungry while you were busy reading, but all of these 11 burgers are OC's absolute best. Mick's used to be a lunch-only place whose reputation for outstanding burgers rumbled through the rumor mill of isolated Irvine office workers. But the popularity of its affordable gourmet meat delivery devices now keeps the place open on nights and weekends, so anyone can come and order a hearty Baja Burger (guacamole, pico de gallo, and sour cream), Mediterranean (hummus and feta), or the original Karma Burger (that secret sauce!) for under $7. 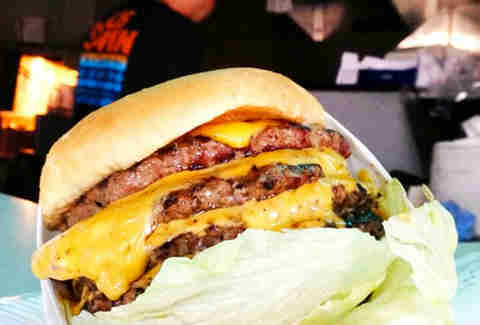 This Anaheim Hills-based mini chain says it takes three things seriously: burgers, bacon, and beer. 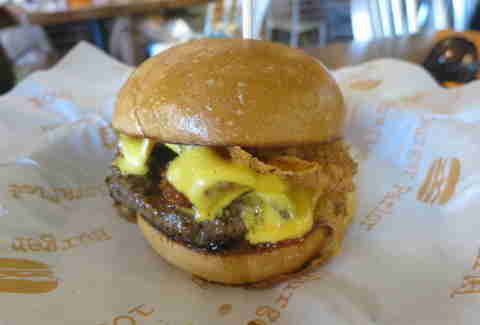 To prove it, its signature burger patty is made from 50% beef and 50% ground bacon (thus the "50/50"). Feel free to customize this big boy burger patty with your favorite sauce, bread, and self-proclaimed "over the top" add-ons like peanut butter and jelly, fried eggs, Spam, and country-fried gravy. When you cross gourmet and homemade, you get "gourmade", which is exactly what the burgers at Peter's Gourmade Grill are, hand-formed patties and all. A Tustin shack that used to be in a gas station parking lot, Peter's now sells favorites like the ABC (avocado bacon cheeseburger) and the Bubba (bacon, crispy onions, BBQ sauce) from a spruced-up storefront right off the 5 freeway. Try the genius Gooeys on the side -- sweet potato fries sprinkled with brown sugar, maple syrup, and marshmallows. 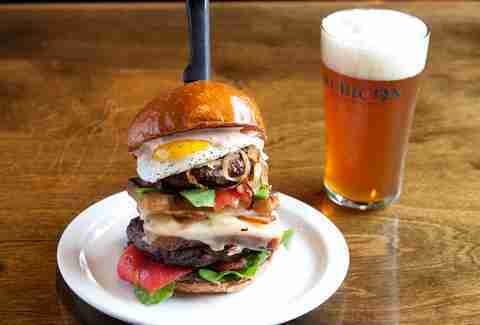 Fullerton's hometown gastropub serves four burgers, each more decadent than the last. The Plain Jane is the basic burger with lettuce and sun dried tomatoes; the Pork's a pig patty with manchego, fried egg, and tomato confit; the Blue Cheese comes with bacon jam; and the Bradley has slices of "bacon", which are actually pork belly that take four days to cure and cook. 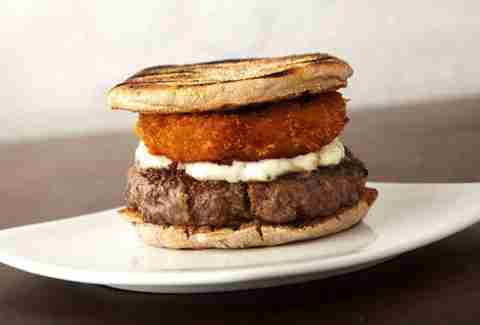 All of them come in intimidating burger-tower form, as all the best burgers should. Like In-N-Out? Try In-N-Out on steroids. Burger Parlor opened to much fanfare a few years ago, and its dozen imaginative burgers feature bizarre toppings like marinated beets, fried jalepeños, and Sriracha aoli. 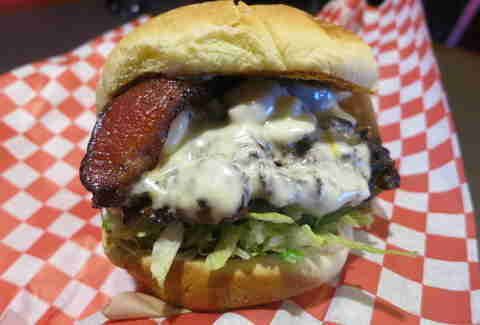 Plus, the patty on the Smoked Bacon Royale comes wrapped in bacon. And one more time for the people in back: THE MEAT PATTY IS WRAPPED IN BACON. Most of TK Burger's five locations are adjacent to the sand, making their essential burgers (served on a puffy white bread or oat-flecked wheat bun) the perfect way to offset heat exhaustion after a full day in the water. Even if you're not seeking surfer fuel, TK's $6.29 cheeseburger-and-fries special is basically a rite of passage for anyone claiming to know OC eats. 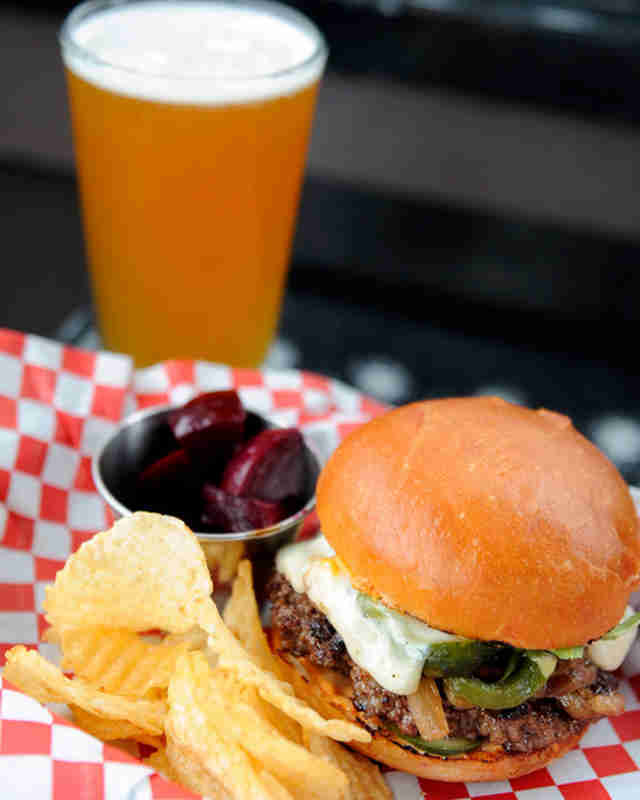 Two words: Bulgogi Burger. 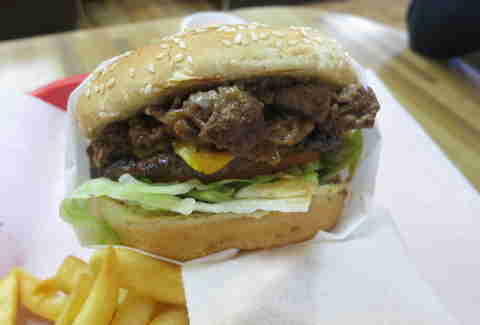 At this no-frills, Korean-owned, strip mall burger joint in the middle of Garden Grove, a mound of marinated Asian meat makes the perfect topping for Apollo's already-oversized cheeseburger (yes, there's still a burger patty under there). And with a layer of mayonnaise and melty cheese to tie the whole thing together, this is one gooey, meaty, must-try take on the Philly cheesesteak. 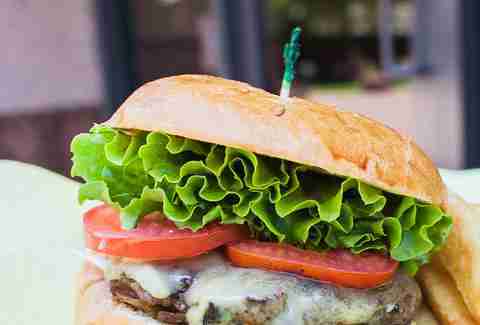 Dig deep enough into Orange County for a good burger and you'll inevitably arrive at San Clemente's Riders Club Cafe, a "slow fast food" establishment right on the Southernmost OC city's main drag. Hand-pressed real meat (blacked on the edges) comes piled high with your choice of mix-and-match toppings along with a certain delicious je ne sais secret sauce. When your burgers start with a top-secret, proprietary blend of prime chuck, short rib, brisket, and hanger steak, you don't have to add much more to achieve ultimate flavor potential. Newport's Crow Burger Kitchen takes its burgers to new burger heights, though, with patties that come topped with cream cheese, pork loin, and (seriously, you guys) mac 'n cheese. 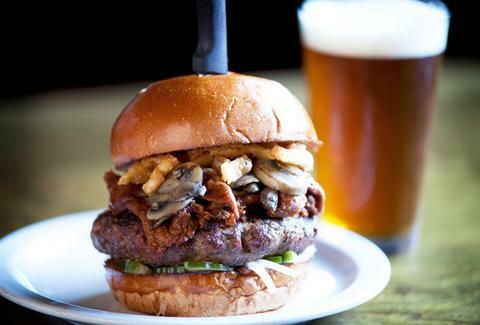 Rumor has it that at this Old Towne Orange gastropub, the $14 Haven Burger accounts for 10% of its overall sales -- and it's easy to, uh, taste why. 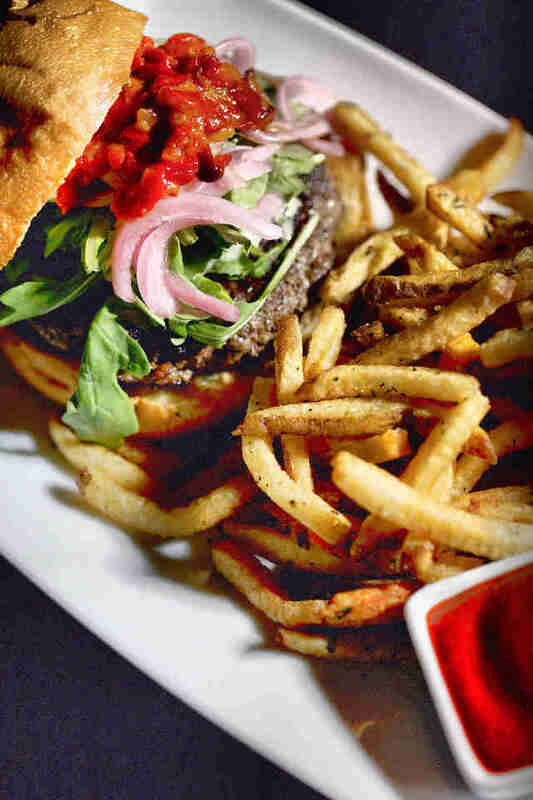 It starts with a custom-ground, mostly beef patty (65% chuck, 15% short rib, and 20% pork fat) that gets topped with St. Agur bleu cheese, jay leaf arugula, roasted red bell peppers, pickled red onions, and garlic aioli on a brioche bun. Volcano Burgers is like that place that all the kids go to after school in Fast Times at Ridgemont High, except it's across from Los Alamitos High School instead. 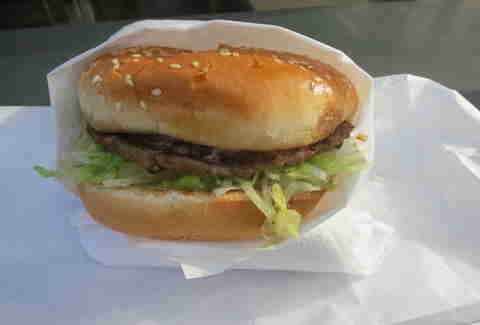 And in case you're wondering why it's so popular among the broke-and-teenage set: just $3 nets you a basic Volcano Burger, a thin, cheese-less beef patty with mayo and shredded lettuce on a sesame seed bun -- all the growing body essentials. Sarah Bennett is a freelance writer based in Long Beach covering food, beer, music, art, and culture for a variety of local and regional outlets in the greater Los Angeles area. Follow her on Twitter at @thesarahbennett.